Few people have done as much to destigmatize alcoholism and drug addiction as former First Lady Betty Ford, who overcame lifelong prescription pill and alcohol addictions in the late 1970’s and then went on to found one of the nation’s leading addiction treatment facilities, The Betty Ford Center in Rancho Mirage California. The legendary Betty Ford is dead. Though she was popular as an open, outspoken and honest First Lady, by the time Betty Ford moved into The White House she was already dealing with a long addiction to prescription pain killers and a growing addiction to alcohol. 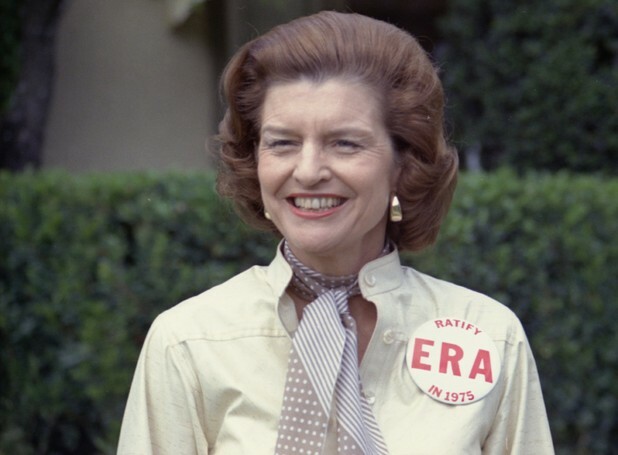 Perhaps more popular than her steady husband, Betty Ford won admiration along with controversy for her willingness to share the intimate details of her life and her true opinions to a national audience. Such as when diagnosed with breast cancer just 2 months into her role as First lady when she went on TV to tell the nation about her need for a mastectomy and to encourage women everywhere to get checked out. Gerald Ford lost his presidential reelection bid in 1976 to Jimmy Carter, and by 1978, Betty’s drinking and drug use had spiraled out of control. Ford talked about feeling useless once out of Washington and admitted to taking as many as 25 pain pills and Valiums per day before moving on to vodka tonics before and after dinner. As things got worse, Betty’s family got in touch with professional help to stage a family intervention and to get her into a much needed treatment program at the Navy’s rehab clinic in Long Beach. Four years later and four years into recovery, Betty founded the Betty Ford Center, which has become one of the most respected names in addiction treatment and which has seen some 90 000 people healed through its doors over the past 30+ years. Notable graduates of the Betty Ford Center include Johnny Cash, Lindsay Lohan, Elizabeth Taylor and countless other celebrities. When asked why she went on to found her namesake treatment facility, Ford replied, "They have to know there's help for them…There's not only help but there's hope for them." Betty Ford Center graduate, actress Ali McGraw, released a statement on hearing of Ford’s death, saying, "She changed so many of our lives with her courage and intelligence, her honesty and humility, and her deep grace. Her vision impacted my own life as few people have." In another tribute, President Obama praised her for her good works, saying, "After leaving the White House, Mrs. Ford helped reduce the social stigma surrounding addiction and inspired thousands to seek much-needed treatment." But though on her death so many have come forth to pay tribute to her influence, she retained a sense of humility throughout her life; a character exemplified in her autobiography, where she wrote, “I am an ordinary woman who was called onstage at an extraordinary time. Through an accident of history, I had become interesting to people." Living with a person with bipolar is overwhelming. We often neglect ourselves and this can lead to burnout. Here are some tips for caring for yourself when the goal is to help a love one who has bipolar disorder. SNL star Darrell Hammond found fame for his legendary portrayals of Bill Clinton, Al Gore and others, but behind the bright lights he struggled with the legacy of a terribly abusive childhood and with cutting, drinking and cocaine.